My first ride was probably on a postie or dirt bike on the farm up in the Highlands where we were raised. We were always around bikes as kids, one of my earliest memories is sitting on top of Dad’s BSA, polishing as far as my arms would reach while he’d be working on it. Dad loves classic racers; he’s owned Triumphs, BSAs, Nortons, Matchless and Ducatis. Pop and my brother have always had motorbikes too. Their love for life on two wheels has definitely influenced my own. What was your first motorcycle and where did you ride it? 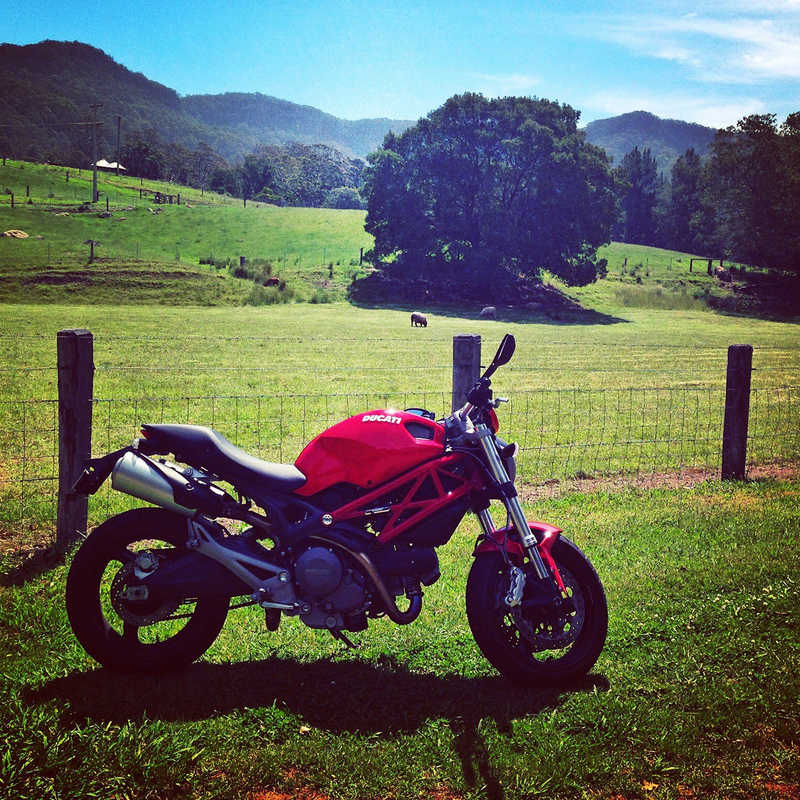 I picked up my first road bike on Valentine’s Day, a red Ducati Monster 659 named Valentino. I’d only been living in the Illawarra a little while, and my Duc took me up and down the coast as I learnt to ride. There were lots of National Park runs, rides up Keira, down Kembla, to Berry or further south and up to Bald Hill. What wheels do you have now? I’m currently riding a very charming 2013 Triumph Thruxton 900 named Knox. I went in to pick up a helmet and had the guys at City Coast Motorcycles hand me the keys and tell me to take it for a spin. It was love at first braap, and has been ever since. What has been your most memorable motorcycling experience to date? 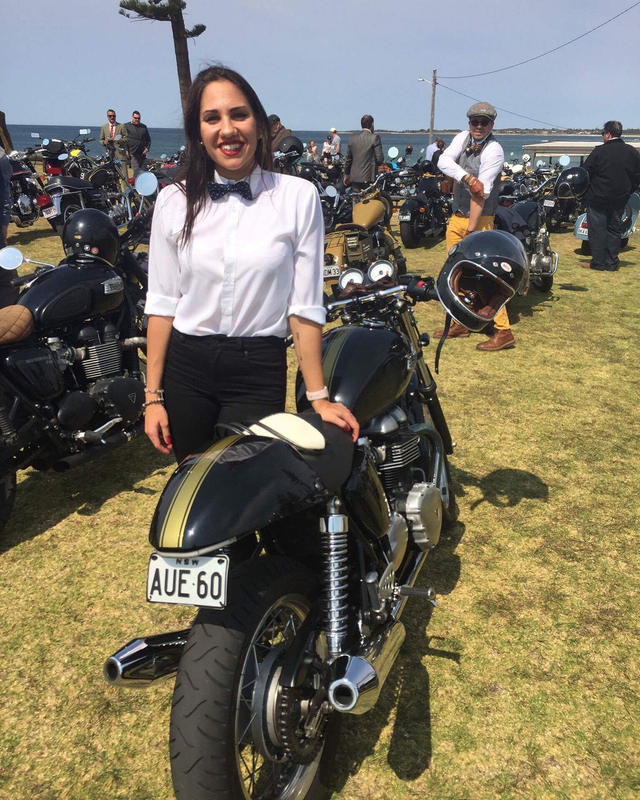 For me every ride is a memorable experience, there’s a really strong and encouraging motorcycling community in the Illawarra and I often ride with my motofam, the Illawarra Café Racers or The Litas Wollongong. We’re blessed with so many beautiful coastal roads here. The Distinguished Gentleman’s Ride last year though was superb, really well organized and for such a great cause. I’m excited for this year’s one. In partnership with City Coast Motorcycles and The North Wollongong Hotel, The Litas held a Santa Pub Crawl Charity Ride. It was fun riding across the Sea Cliff bridge in Santa suits and raising money for a local cause. We’re really grateful to be supported by local businesses. Motorbikes have been like ‘a rock’ to you. Can you share with us how they have helped you? I remember dad saying that you don’t see motorcycles out the front of psychologist’s offices, and you know I think he was onto something. I was diagnosed with anxiety and depression just before I bought my first bike and I found that riding really helped me to be mindful, to spend time close to Mother Earth and to be around good people. It’s amazing the type of healing a bike can provide. If ever I’m stuck a ride on my bike really contextualizes things for me. I always return with a heart full of gratitude. How did the idea for The Incredible Freedom Machines come about? The Incredible Freedom Machines tells the story of a little girl and her adventures with her Freedom Machine. For me, this book is a metaphor for my own adventures on Valentino. The day that I wrote it, I’d been riding through the National Park, and along the coast before arriving in Keiraville for a cup of tea. I wrote the whole manuscript in one sitting, sent it to Matt Ottley, one of Australia’s best illustrators with the email subject: ‘Be my Illustrator?’ and was absolutely flawed when he sent it to my now editor at Scholastic. What age group is The Incredible Freedom Machines pitched at? This book could be read to Preschoolers or analyzed for literary studies in High School, though the primary teacher in me sees it being loved dearly by Primary students. The illustrations (which I can take no credit for) are the most divine creations, I couldn’t have dreamt them better. This book is getting excellent early reviews. What do you have planned next? Thank you! It’s really exciting seeing it hitting shelves. The Incredible Freedom Machines has been selected for presentation at the largest Children’s book fair in the world, Bologna Book Fair (May 2018). It’ll be pitched there to hopefully be published in other languages. It’s also being presented as a part of The Sound of Picture Books in Fremantle, where an accompanying orchestral piece will be played by the Perth Symphony Orchestra as Matt Ottley (The Illustrator) draws and I narrate for school audiences. I’ll be Writer In Residence at Bundanon Trust in August for Book Week, sharing The Incredible Freedom Machines with local schools. My second book, Our Dreaming is being illustrated at the moment by Dub Leffler and will be out in June 2019. I’ve also got two more manuscripts under consideration with Scholastic at the moment and have been working on a poetry collection as well titled Mother, Earth Child, Lover. Can you tell us about your work at Red Room Poetry? Red Room Poetry is a NFP that aims to make poetry a meaningful part of everyday life. 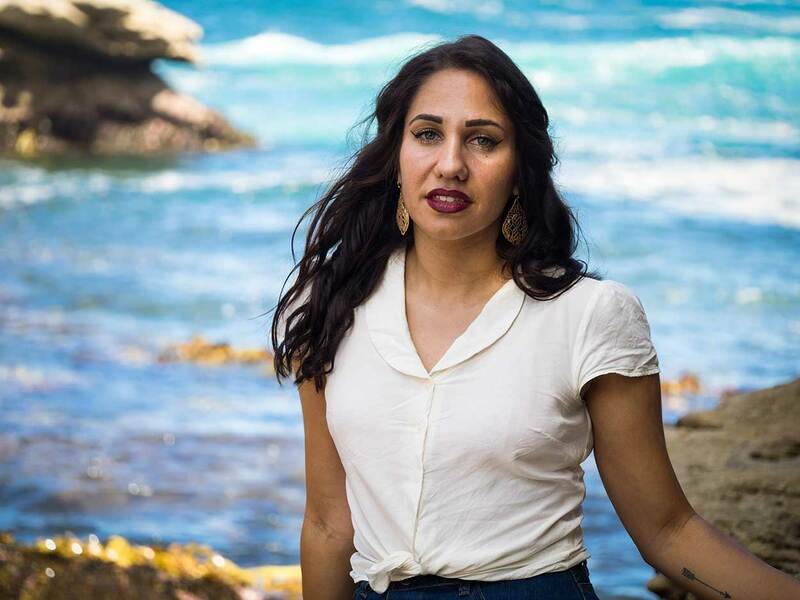 I manage Red Room’s Poetic Learning programs, connecting contemporary poets with 450+ education communities across Australia & New Zealand. I am also the First Nations Cultural Liaison at Red Room. I’ve developed a program titled, “Poetry in First Languages” that sees First Nations poets create and publish poems in First Languages with Elders and Custodians while also supporting students on country to do the same. As a proud Gunai woman with ties to lots of east coast nations, seeing First Nations students use language to express themselves creatively is really powerful. This year we’re leading workshops on Gundungurra, Dharawal, Gadigal, Bundjalung and Yuin Nations with local communities. 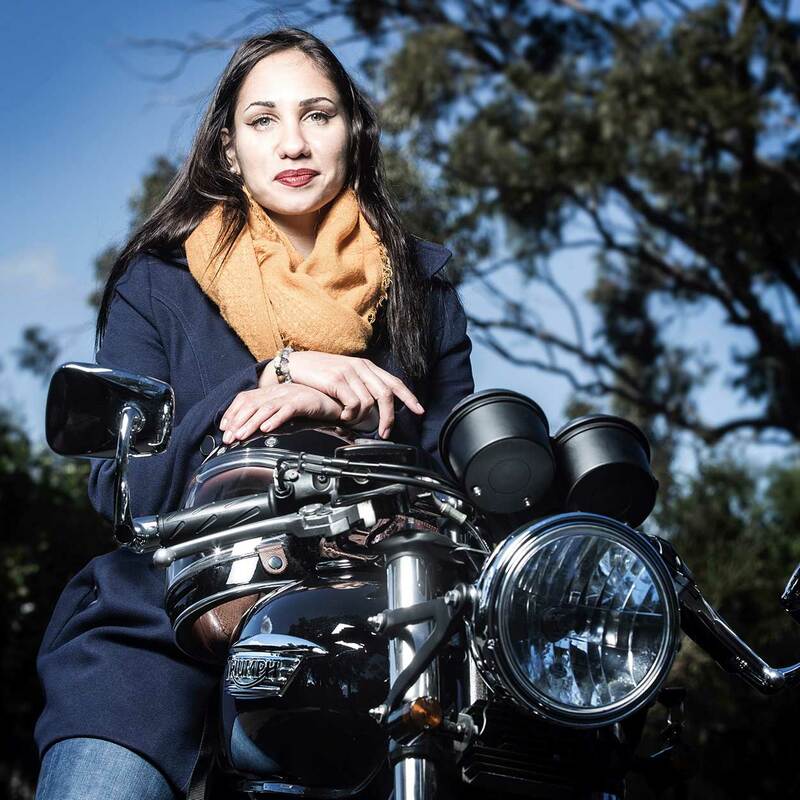 You are a co-founder of the Litas Wollongong branch which is part of a worldwide, all-female, social riding collective. How is it going? 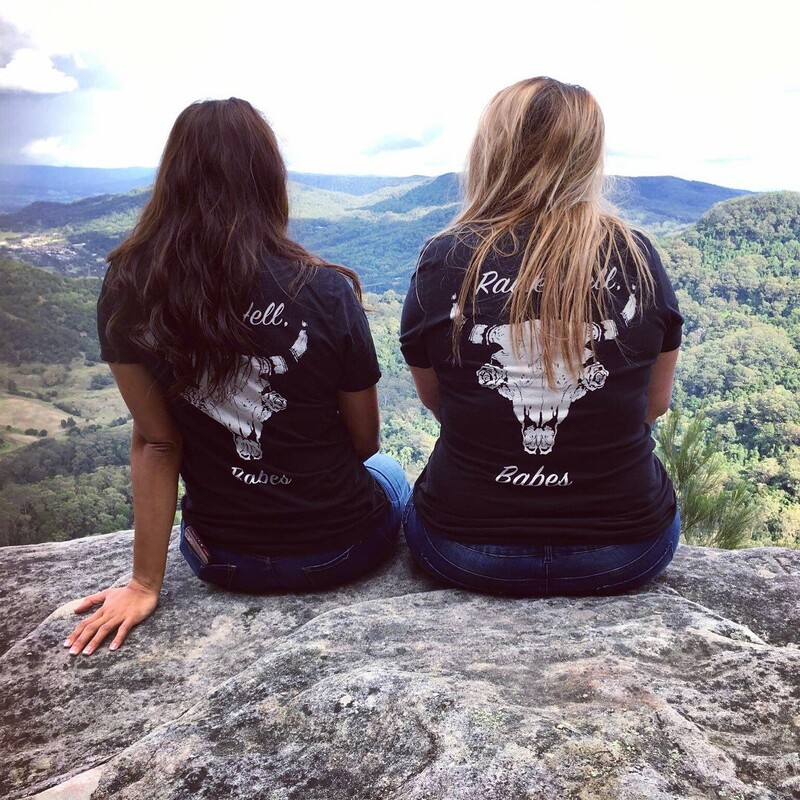 The Litas are a group of phenomenal women riding and thriving all around the world, I feel really honored to be a part of the crew and even more so to have helped start a movement in Wollongong with Sari Lokollo and Jessica Knight (the other Co-Founders). I’ve been so flat out of late that I haven’t had a chance to get along to many of the rides, but there’s always ride outs, camp outs and wrench nights happening. I encourage all female motorcycle riders of all skill levels in the Illawarra and surrounds to get involved. Do you have any advice for women getting involved in riding? My advice is to absolutely do it. Buy the bike, buy the leathers and start your adventures. Riding motorcycles has helped me develop confidence and independence in ways I couldn’t have imagined. I’d suggest researching widely and finding a bike suited to your style, build and ability. Getting some quality, well-fitting protective gear is also paramount. My other advice would be to join The Litas or another club of riders, or ride with some more experiences friends, follow their lines and take their tips on board. Like all new ventures, you must do it often in all conditions and practice practice, practice. We think the Illawarra boasts some of the best moto daytrips in Australia. Do you have a favourite? There’s so many great rides around the Illawarra. I do love a cheeky braaap to Bald Hill and back; I think this one is best during the week or even in the evening when the road is a little quieter. I also love extending that ride into the National Park. Riding up Mount Keira and down Kembla with lunch at the pub is always a good time. Heading out the back of Jamberoo, finishing in Kiama or heading to Berry is delightful too. You can’t go wrong with a ride up the Macquarie Pass up into the Highlands either. Overall though, I love cutting along the Upper Kangaroo Valley River, to the suspension bridge. That spot is all kinds of magic. 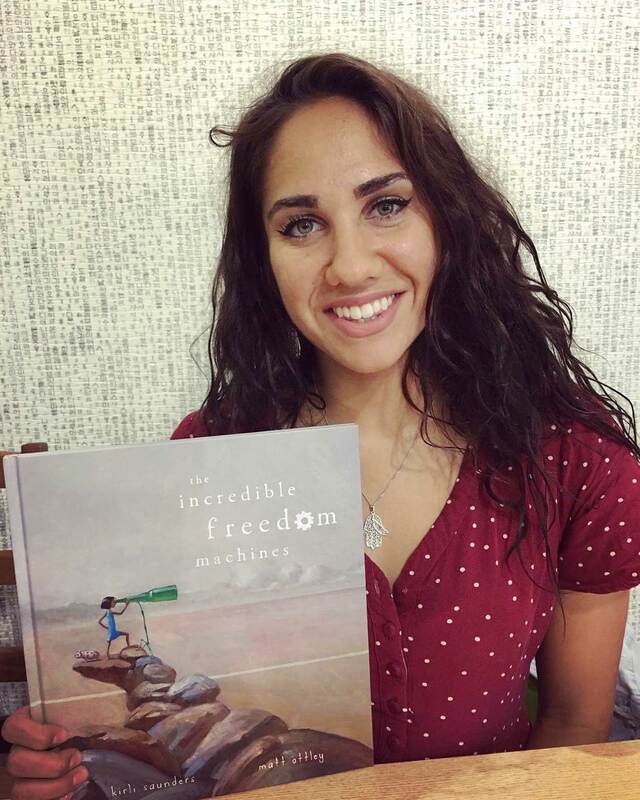 Kirli Saunders’ The Incredible Freedom Machines from Scholastic Australia is available at all good book stores.